Drexel junior forward Nicole Jones posts up with the ball under the basket during the Dragons 52-60 loss to Long Island at the DAC Nov. 11. Jones had six points and four boards. Denise Dillon will have to wait at least one more game for her 144th career win, which would eventually tie her with Lil Haas as the winningest coach in Drexel women’s basketball history. “It seems like the longest year in history of trying to accomplish that,” Dillon said. 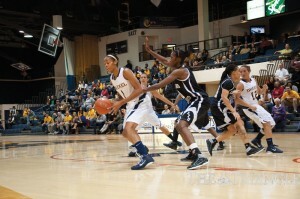 Her Dragons fell 56-51 to James Madison University in a nail-biting overtime game Feb. 9 at the DAC. The game was a game of runs for the Dragons (11-11, 7-5 Colonial Athletic Association). JMU jumped out to a 7-2 lead, but the Dragons tightened up on the defensive end and were able to go on an 11-0 run, led by Tyler Hale’s six points and capped off by a Fiona Flanagan three-pointer, extending the Drexel lead to 13-7, which caused JMU coach Kenny Brooks to take a timeout with just under 10 minutes to go in the first half. After the timeout, the Dukes (18-5, 9-3 CAA) were determined to swing the momentum back in their favor, and they did. They were able to get open looks in the paint, which sparked an 8-0 run and put them ahead 15-13 with 3:48 to go. Dillon attributed the streaky game to defense. Forward Lauren Whitehurst scored four points during the run. The Dragons didn’t falter, and the physical first half ended with the teams trading buckets and going into the locker room with JMU up 19-18. James Madison came out firing to start the second half, jumping out to a 30-24 lead in the first five minutes. However, the Dragons hung tough, not letting the game get too out of hand. With eight minutes to go and the Dukes leading 38-30, the Dragons took off on another 11-0 run, taking the lead 41-38. Drexel could not slam the door on the Dukes, though, and with 28 seconds left and nine seconds separating the shot clock and game clock, the Dragons had the ball. Hollie Mershon took the ball at the top of the key and drove baseline right, missing a contested shot. The Dukes got the rebound and missed a half-court heave, sending the game to overtime. Drexel began the overtime with two turnovers and could not recover after that. JMU had an eight-point lead, but the Dragons didn’t quit, cutting it to three at one point before losing 56-51. There were two key stats to the game. The Dragons were out rebounded 59-41, and although they played in the paint and were able to drive the lane, the Dragons did not attempt a free throw until overtime, while JMU attempted 25 free throws. “The only reason we were able to stay in the game is because they missed them,” Dillon said of the Dukes, who shot a lowly 40 percent from the charity stripe. Mershon finished with 17 points, and Kamile Nacickaite had 12 to pace the Dragons. Tarik Hislop, one of the top scorers in the CAA, finished with 22 for the Dukes. Next up for the Dragons is a trip to Williamsburg, Va. Feb. 12 to take on The College of William & Mary at 2 p.m.
“We will really need to stay focused on the defensive end,” Dillon said of the upcoming road trip. William & Mary has had its struggles this season with a record of 9-14overall and just 2-10 in the CAA. The Tribe has four players averaging double figures in scoring and a team average of 72 points per game, so the Dragons’ defense will need to be extra sharp so as not to allow William & Mary to sneak up on them. After their trip to Williamsburg, the Dragons will return to Virginia Feb. 16 for a bout with Old Dominion University in Norfolk at 7 p.m. ODU has struggled as well this year with a mark of 8-16 overall and 5-7 in the CAA. The Monarchs, however, possess one of the most dominant players in the CAA in Tia Lewis. She is averaging over 18 points and nine rebounds per game. The Dragons will need to show their focus on the road to get these two absolutely critical CAA wins.